I couldn't fail to recognise The Grownup as the work of Gillian Flynn when I spotted it on the checkout counter at Waterstones, amongst the other "impulse buys". The dark cover, typography and deliberately stark design screamed "Gone Girl" from a mile away. Adding just a few more pounds to the total of the pile of books I'd already decided to purchase didn't seem that much to pay. This is definitely a "single serving" story. It's short format is easily digested, perhaps even short enough to read during a commute.Unfortunately, I didn't find it to be a particularly satisfying story: in my humble opinion, the final third or so really ought to have been more drawn out. Did Flynn have to edit a longer tale to make it shorter, I wonder? 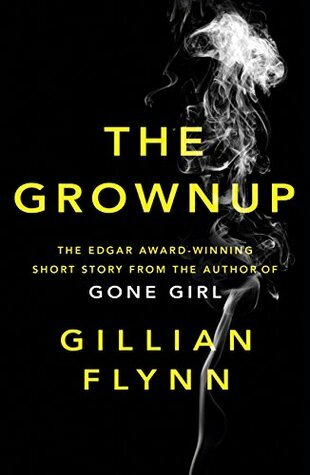 Like Gone Girl and Dark Places, Flynn's short story includes some very adult themes. Right from the first page, we are introduced to a seedy underworld, where the main character performs sexual acts alongside manipulative psychic readings. The Grownup pays homage to gothic horror in the descriptions of a sinister mansion and a haunting teenage boy. As expected of Flynn's work, the tale takes an unexpected twist, which I rather enjoyed, particularly as I couldn't see it coming. Yet as mentioned before, there was not enough explanation of the twist to ensure this was a wholly satisfying tale. I'd love to read more shorter works by Gillian Flynn. Her depictions of strong, slightly unhinged women are fantastically refreshing, and she's brave enough to explore society in ways many other authors find unnerving. Unfortunately though, The Grownup is not among her best works.